KIEV, Ukraine -- When he ripped down a separatist flag from the main government building in Novohradovka, his hometown in eastern Ukraine, Oleksandr Hurov knew he was in for trouble. 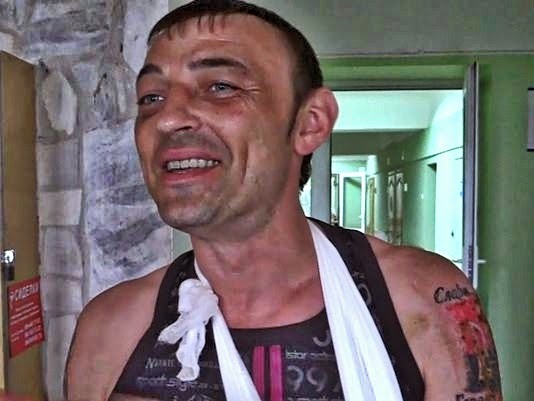 Ukrainian miner Oleksandr Hurov describes his torture at the hands of Russian rebel captors. Retaliation was quick, and ruthless. Two weeks later, the 36-year-old coalminer lies in a Kiev hospital with a fractured jaw, a broken nose, a lacerated arm and cracked ribs. "They beat me nonstop," he told RFE/RL. "I was lying on the ground; they kicked me and hit me on the head with a gun. One of them held my arm outstretched while another one jumped on it. I passed out from time to time, which was great because then I couldn't feel the pain." Hurov says his assailants called him a "traitor" and tried to peel off the nationalistic tattoo on his shoulder – inscribed with the words "Glory to Ukraine, glory to the heroes" – using the jagged edges of a smashed light bulb. Hurov's grisly story is an increasingly familiar one in eastern Ukraine, where pro-Russian separatists are accused of waging a campaign of abductions and torture as they seek to consolidate their grip on the region. They have readily admitted to the hostage-takings, which have targeted local officials, pro-Ukraine activists, journalists, foreign monitors, aid workers and generally all those deemed critical of the self-styled "People's Republics" formed last month in the Donetsk and Luhansk regions. And with the separatist movement getting more organized, the abductions appear to have taken on a systematic, methodical nature. "I would not call these isolated incidents; we definitely can see a pattern," says Anna Neistat from Human Rights Watch (HRW), who recently traveled to the Donetsk region to investigate the kidnappings. "Every single day I would receive reports about yet another person being either abducted or released after being subjected to beatings and torture in captivity," she says. According to Neistat, the victims she interviewed suffered "horrendous" violence and acts of cruelty that in many cases led to serious injuries. HRW estimates that several dozen people are currently being held by the rebels. Anton, a former separatist militant, corroborated the claims in an interview with RFE/RL. The 25-year-old, who gave only his first name for fear of reprisals, said he defected from the insurgency after seeing pro-Ukraine hostages being hauled up the stairs of the Donetsk regional council building – the separatists' headquarters -- bloodied, screaming, and with hoods pulled over their heads. "People are beaten and then 'disciplined,'" he said. "They are forbidden to use the word 'Ukraine,' to speak Ukrainian, they are told this is now Russia. So yes, captives are beaten and tortured. Then they are taken to the outskirts of the city and released." Not all, however, survive the ordeal. Last month, the bodies of two men were found in a river near the eastern Ukrainian city of Slavyansk bearing signs of torture. One of them was identified as Volodymyr Rybak, a local official kidnapped in broad daylight shortly after being assaulted by a pro-Russian mob for taking down a separatist flag. A number of abductees have been missing for weeks and are feared dead. Simon Ostrovsky, a U.S. journalist detained by separatists in Slavyansk for three days, says he saw a dozen other captives in the cellar of the city's rebel-held office of the SBU state security services – described by Neistat as "a black hole" into which many people have disappeared without a trace. Ostrovsky says some of them had been held there for two weeks. Like most other hostages, Hurov says he was kidnapped in broad daylight by a group of heavily armed, masked men. He was taken along with five fellow pro-Ukraine activists -- another miner and local Novohradovka officials loyal to the Kiev government -- who had gathered on May 4 to discuss ways to get separatists out of their hometown. He insists their group was peaceful and had focused mostly on removing separatist flags from buildings. The activists were shoved into a minivan and taken to the regional council building in Donetsk, an 11-story facility that now serves as headquarters for the "Donetsk People's Republic." The building, ringed by barricades and barbed wire, has become notorious as the shadowy nerve center of the separatist movement. Interrogations and beatings are rumored to take place on the fifth and sixth floors. Witnesses say a makeshift hospital has been set up on the second floor, with its own operation room and a crew of about 50 medics working in shifts. Hurov said his captors took him to the fifth floor after briefly parading him outside the building with a Ukrainian flag wrapped around his head. "They ushered me into an office," he says. "I could hear my friends screaming from adjacent rooms." There, he says he was repeatedly beaten, abused, threatened with death, and injected with a substance that left him groggy and disoriented. He was released the next day, allegedly in exchange for captured separatists. The other five activists were also freed. According to Anton, the former separatist, the men working on the fifth and sixth floors are from eastern Ukraine. He says they have well-honed interrogation skills, suggesting backgrounds in law-enforcement and intelligence services. But he confirms rumors that fighters have arrived from Russia, including Cossack units, to support the separatists. He also corroborates reports of a makeshift clinic at the regional council building in Donetsk, where medics treat wounded militants and occasionally patch up hostages. He claims that last week's raid on the offices of the Red Cross in Donetsk, during which a group of aid workers were held for seven hours, was aimed at seizing drugs for the separatist clinic. At the time, a spokesman for the "Donetsk People's Republic" said the Red Cross employees – one of whom was severely beaten -- had been detained on suspicion of espionage. Since defecting, Anton has lived in fear of being himself "disciplined" by his former comrades-in-arms. "If they find out about it," he says," they won't forgive me." Hurov, too, fears for his life and the life of his wife and child, who followed him to Kiev after receiving threats. He is not planning to return to eastern Ukraine, where he says the "Donetsk People's Republic" has sentenced him to death. Asked about his plans for the future, Hurov is at a loss. But there are two things he is set on doing as soon as he is discharged from hospital. The first is to continue the struggle for a united Ukraine. The second is to restore his tattoo. "I promise it will be even more beautiful and brighter than before," he quips. "There'll be scars, but it can all be fixed. Everything's going to be alright."